The intense competition in the healthcare industry is triggering unprecedented benefits to the patient fraternity. While the quality of medical care has improved by leaps and bounds, patients now, have choices and alternatives just in case they feel deterioration in the perceived level of medical care. This sudden shift in favor of patients means physicians will now have to devise ways in not just attracting patients but also retaining. Patients often feel it difficult to schedule an appointment with their doctors owing to doctor’s busy schedule. While it may be true that doctors are always pre-occupied with some medical emergency or the other, yet it is the duty of the support staff to accommodate slots so that patient need not go disappointed with not having to schedule an appointment with the doctor/s they feel more secure with. Patients often complain of support services during their stay in the medical facilities. This will have a serious impact on patients’ decision to come back again. Therefore, support staff, along with administering clinical duties as per doctor’s advice, should also make patients feel at home. Most physician support staff deems it complete once the patients are discharged from the facility. But, medical care concern goes beyond that; patients will be happy if they are enquired of the progress post discharge. Moreover, it kind of restores their faith in the medical facility from which they had derived medical care. Physicians would not have been concerned if they had only to assign these services as part of their endeavor to engage and retain patients. But, the fact that most of the support staff’s energy is spent on billing and negotiating claims with insurance companies, there is a likelihood of adverse impact on physicians’ main objective of patient engagement and retention to augment dwindling practice revenues. The thought of expanding the base of support staff to augment medical billing too is losing its relevance owing to heavy implementation cost associated with mandatory EHR, and the ensuing ICD-10 & HIPAA 5010 compliant clinical and operational practices. In such a scenario, physicians would do well to entrust their support staff with only clinical functions, and outsource medical billing, and Revenue Cycle Management (RCM) services from competent and credible sources. 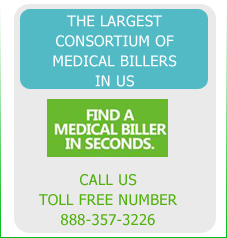 Medicalbillersandcoders.com – being the largest consortium of medical billers and coders in the U.S – is resource-rich in dispensing valued-added services in medical billing and RCM. Its comprehensive suite of medical billing and RCM – comprising patient scheduling and reminders, patient enrollment, insurance enrollment, insurance verification, insurance authorizations, coding and audits, billing and reconciling of accounts, account analysis and denial management, A/R management, and financial management reporting – is ample proof of its competence. As the insurance reimbursement environment becomes increasingly stringent, the incidence of denials, delays, underpayments, and lost or ignored claims seems to be on the rise. Consider this interesting statistics compiled by the Centers for Medicare and Medicaid Services (CMS: 70% of claims are paid the first time they are submitted; 30% of claims are either denied (20%) or lost or ignored (10%); 60% of denied, lost or ignored claims will never be resubmitted; 18% of claims will never be collected. Therefore, it is obvious that physicians are losing a substantial portion of their reimbursements unable to keep pace with medical billing challenges. But it is not a thing that can be neglected as medical reimbursements happens to be the life-line of medical practices. While it is certain that the dwindling reimbursement rates are the resultant of inadequate medical billing and RCM practices, it is also true that physicians have not been fully responsive to web-based medical billing and practice management software, which are deemed to be far superior to manual billing practices. The fact that physicians can expect today’s medical billing technology to adapt to situational demands of medical billing reimbursements makes these web-based medical billing and practice management software indispensable to resurrect the dwindling reimbursements, which on an average aggregate to $125 billion yearly. The first step in claim realization begins with accurate coding without scope for denials. Therefore it is imperative that physicians’ medical billing is intuitive enough to forecast and adapt in such way that would negate the chance of denial. But, because billing staff’s ability is limited, billing software with proactive rules engine has become more reliable. The significant thing about proactive rule engine is that it can automatically identify claims that are likely to be denied and correct them before being submitted for claims. Consequently, you can expect an increase in first pass resolution rate, acceleration of claim realization, and considerable reduction in workload for your in-house staff. It is strange yet true that practices are reimbursed far below than what they are entitled for. Moreover, the reimbursements tend to be different despite the procedure being the same. While these discrepancies in reimbursements rates may emanate from payer contracts, it is highly unlikely that physicians will be able to figure exactly which payer contract is yielding underpayment. Fortunately, they can turn to software that can automatically compare the actual payments received with the payments specified in each payer contract, and alerting them when discrepancies occur. Such software module that is capable of tracking discrepancies in reimbursements will eventually augment collection rates, promote physicians’ efficiency and growth, and make accurate financial prediction. The efficiency of claim realization has always hinged on how best physicians handle A/R Management. Time factor is the crucial thing in A/R Management: less time your claims stay in A/R bracket, better your practices’ financial health. But, of late physicians have been complaining of their A/Rs consuming more than the admissible time limit of 90 days and eventually ending up as bad debts. Therefore, it is imperative that physicians respond to the challenges in A/R management through seamless integration of claim generation, submission, follow-up, and remediation. Electronic medical billing – built on sound Practice Management systems – promotes harmonious integration of claim generation, submission, follow-up, and remediation aimed at speeding up the Account Receivable Cycle. While physicians contemplate on turning around their practices’ revenues with new found technological platform (electronic medical billing), cost and method of installation may be matter of immediate concern. Assistance from a medical billing service to help install an electronic billing system integrating with the areas most required by the practice and handle the A/R will help improve collections. Medicalbillersandcoders.com – by virtue of being credible, competent, and self-sufficient in offering cost-effective – comes across as a leading name. Its strategic partnership with leading PMS and EHR vendors lends its medical billing services the technological edge. While the Federal Government believes that Physician Quality Reporting System (PQRS) will complement its endeavor to curb the sky-rocketing Medicare expenditure, which has already overshot the Sustainable Growth Rate (SGR) by nearly 25%, the response from the physician community has been a mixed one. Judging by these statistics, PQRS is still a long way from witnessing cent percent voluntary participation from the physicians across the nation. Inevitably, the CMS (Center for Medicare Services), which happens to be the governing body in the US, has made it clear that it will introduce penalties (along with the current system of incentivizing physicians meeting and surpassing the PQRS) beginning with 2013. Consequently, physician community – which looked encouraged by Federal Government’s recent announcement of extending Medicare to every citizen – will have to contend with mandatory PQRS compliance to avoid getting penalized. One of the first steps to comply by PQRS mandate is the implementation of an effective and efficient EHR implementation for clinical and operational excellence. Furthermore, such EHR implementation should be customized in a way that responds to Medicare’s PQRS requirement. Physicians, who are already faced with the monumental task of transiting to ICD-10 and HIPAA 5010 clinical and operational functioning, will surely be overwhelmed by the PQRS burden. As physicians seek to collaborate with external service providers for PQRS-specific EHR implementation, and ICD-10 & HIPAA 5010 compliant clinical documentation needs, Medicalbillersandcoders.com – with the requisite technical competence and professional excellence – should not only be able to ensure PQRS-specific EHR implementation, but also make it responsive ICD-10 and HIPAA 5010 compliant clinical documentation needs. The combination of strategic partnership with leading EHR vendors, a dedicated a team of Medicare billing & coding professionals, and a rapport with Medicare makes it the most sought-after Medicare billing service provider in the U.S.
How do modifiers increase your AR by more than 60 days? The number of days a physician’s takes to collect their receivables is a good indicator of how well the physician’s clinic is collecting its accounts receivables. Other mental health groups- about 19 – 35% of their Total A/R collected in 120+ days Modifiers key to reducing your AR days! A medical billing service whose main concern is the billing and coding transactions of a practice will assist and benefit your practice to achieve the revenue it deserves. Additionally MBC’s customized reporting along with a dedicated account manager assures regular, accurate and detailed modifier checks. MBC is constantly striving to update and improve the RCM cycle in turn reducing AR to achieve the right revenue for your organization. The sway that business offices can have on reference patterns amongst consumers is a tactical opportunity as the insurance market moves to high deductible plans and hospitals take in new physicians into their business. According to a survey conducted by Connance in 2011 Americans who received hospital services in the past 2 years, merely 21% of patients engaged with the business office after discharge are completely contented with hospital billing, and those less happy are less liable to recommend the hospital to their friends and acquaintances. Moreover the survey also suggests that among the insured respondents, 31% had high deductible plans. Overall contentment with the hospital billing procedures is low with just twenty one percent awarding billing processes a score “5” (on a 1 to 5 scale) and sixty five percent giving a “3” or less. Customers with balances due of fewer than $100 are likely to be less unhappy, with thirty six percent giving business office procedures a top score of “5” and forty six percent a “3” or less. Among those with balances over $100, just fifteen percent scored the business office process a “5″ whereas seventy two percent rated it a “3″ or less. General contentment at discharge is high compared to satisfaction in later months. When asked to rate their satisfactions with the general hospital experience at the time of discharge, 32% are completely contented. When requested to rate their general approval with the hospital experience post-discharge and subsequent to business office processes, as mentioned earlier merely 21% percent are completely contented. The billing process has a definite impact on patient satisfaction and optimizing the process would not only increase the satisfaction of consumers but also positively affect the revenue. A simple way of maintaining the quality of the billing process without high costs is outsourcing the process to professionals who have experience in this area. This would ensure that wastage due to a high insurance denial rate does not happen and hospitals and clinics are paid the right amount at the right time. Medical billers and coders at medicalbillersandcoders.com play a crucial role in optimizing the revenue cycle management of hospitals and providers and thus contribute to a better patient experience and satisfaction. While the recent healthcare reforms ushered in by the Federal Government promises to elevate clinical and operational efficiency across the nation’s healthcare continuum, it is also going to induce physicians into a more accountable and responsible quality clinical regime. The imminent Accountable Care Organization Model, Medicare cuts, the fear of Sustainable Growth Rate (SGR) backlash, the compulsory implementation of EHR, coupled with the monumental shift to ICD-10 and HIPAA 5010 compliant medical billing and coding have begun to take heavy toll of lone-standing clinical practices. The effective influence of these factors is showing up in an unprecedented exodus to hospital-based employment by both new entrants as well as those that have been practicing for a considerable period of time. While physicians are justified in their decision to safeguard their professional interest, this trend of increasing hospital employment may well jeopardize the remote clinical access to millions of people residing in the remote areas where private practices have been the only source of medical care. Moreover, there is a growing apprehension of this exodus making way for monopoly in clinical care. Either way, there needs to be some kind of balance between hospital-based employment and private practices in the nation’s macro healthcare well-being. Yet again, medical billing and coding specialists, who hold the crucial to this restoring this balance through off-loading the administration task off physicians, come to the fore. Medicalbillersandcoders.com (www.medicalbillersandcoders.com) – with a long-standing reputation of being the credible source for medical billing management comprising streamlined medical billing practices, such as patient scheduling and reminders, patient enrollment, insurance enrollment, insurance verification, insurance authorizations, coding and audits, billing and reconciling of accounts, account analysis and denial management, A/R management, and financial management reporting – is poised to play an important role in this direction.